Give your students an exciting hands-on experience in examining, monitoring and discovering Long Island Sound! The Maritime Aquarium’s revolutionary R/V Spirit of the Sound™ is the first research vessel in the country with hybrid-electric propulsion. She runs quietly and “green,” letting us practice what we teach. The 64-foot catamaran has a climate-controlled indoor classroom and an outdoor research space. Equipped with a wide range of sampling and scientific equipment, she’s bringing the marine world and scientific inquiry alive for a new generation of students. Cruises are 2 hours long and are available by charter at 9 & 11:15 a.m. and 1:30 p.m. September-November and April-June. Cost per cruise is $850. Additional Aquarium admission is optional. Cruises can occur in rain, cold and wind, and will be rescheduled only if dangerous conditions exist. Please dress accordingly! To begin planning your group’s visit to The Maritime Aquarium please call 203-852-0700 ext. 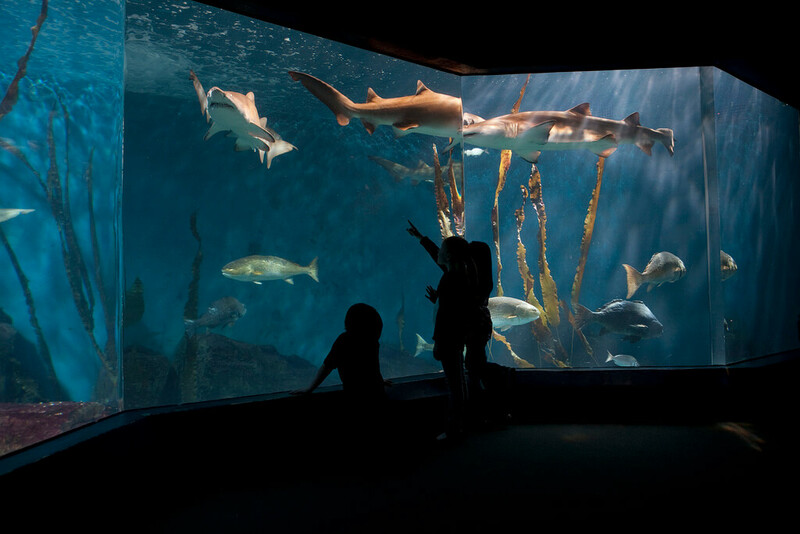 2206 between 9:30 a.m.-4:30 p.m. Mon.-Fri. or email us at: reservations@maritimeaquarium.org. See description above ... with focus on the adaptations of the animals living in Long Island Sound. See description above ... with focus on examining the diets and interrelationships of Long Island Sound animals. In addition to the description above, identify and classify the taxonomy of the animals hauled up from the deep, from microscopic plankton to small sharks. Learn about the conservation issues facing Norwalk Harbor and Long Island Sound. This program provides a fieldwork experience designed to link directly to the AP Environmental Science curriculum. Students collect water samples in the inner and outer harbor. They test for dissolved oxygen, pH, carbon dioxide and other variables, compare the findings in the two locations and discuss the results. For many students, the highlight is getting muddy as they examine a biodredge sample for crabs, mollusks, sponges and other organisms to determine species richness. Disembark at the end of the program with data you have collected and ideas for analysis back in your classroom. This unique program focuses on the physical aspects of the world’s oceans. Students collect and examine plankton samples to spark consideration of how phytoplankton and photosynthesis relate to Earth’s atmosphere. They take weather readings and sample water at different depths, gathering their own data on temperature, salinity and turbidity to contribute to a discussion of the role of the oceans as indicators of global climate change. And they learn how seemingly slight changes in ocean temperatures and currents drive changes in weather in marine and terrestrial environments worldwide. Disembark at the end of the program with data you have collected and ideas for analysis back in your classroom. Study winter biodiversity, including plankton and migrating waterfowl, as you seek out some of the seals that winter in Long Island Sound. Learn about the seals and get a broad picture of how the Sound’s animal population changes in the winter, which animals swim or fly south, which burrow into the mud and which have adapted to the cold. Students will use scientific tools and instruments to measure weather and water chemistry. Binoculars provided. Dress very warmly!